Michelle Brown sold her ranch-style home in San Antonio this summer for $355,000. Instead of paying $21,300 in realtor fees — 6% of the purchase price, which is how realtor fees are traditionally calculated — Brown paid just $13,150, for a savings of more than $8,000. She went with a flat-fee realty company. The company Brown worked with, Redefy, charges a flat rate of $2,500 to sell a home. She still had to pay the buyer’s agent roughly 3% of the purchase price, but she saved thousands of dollars she would’ve also had to pay her seller’s agent. A handful of flat-fee realty companies have popped up around the country in the last five years. Their models vary, but they’re all essentially rewriting the rules for real estate commissions and saving consumers thousands of dollars in the process. These rogue agents say technological advances have made it easier to buy and sell homes, while realtors — especially seller’s agents — are still making the same amount of money for doing less work. Brown was initially skeptical. How could she save so much money? She said she asked thousands of questions before deciding to work with a Redefy agent. “I’m one of those people that, if it sounds too good to be true, it probably is,” she said. Ultimately, the proof was in her bank account. When the sale closed, all she paid to her seller’s agent was $2,500. How Does Flat-Fee Realty Work? To understand what’s different about flat-fee realty companies, it’s helpful to first consider a traditional real estate transaction. Typically, the person selling the home is on the hook for paying all realtor fees, which usually total roughly 6% of the purchase price. The seller’s agent and the buyer’s agent split that commission. Here’s an example: Under the traditional model, a home that sells for $100,000 will cost the seller $6,000 in total realtor fees. The seller’s agent, or the person who puts the house on the market, takes and post pictures and hosts open houses, gets $3,000. The buyer’s agent, or the one who takes buyers to open houses and showings, gets $3,000. Flat-fee realty throws that formula out the window. Some companies, like Redefy, offer a flat-fee commission on the seller’s side of the equation only. If you use a Redefy agent to sell your home, like Michelle Brown did, you’ll pay them $2,500 instead of 3% of the purchase price. You’ll still pay the buyer’s agent the traditional 3% commission. If you use a Trelora agent to sell your home and the person who buys your home is also working with a Trelora agent, you pay the company $2,500 total — that’s it. 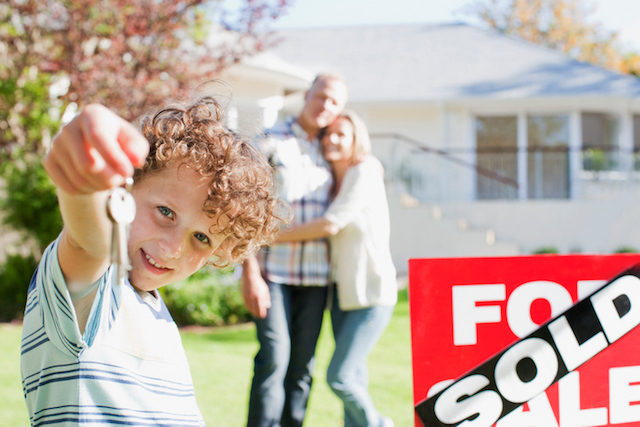 That flat fee covers both sides of the buyer/seller equation. If you use Trelora to sell your home but your buyer is working with a traditional agent, you pay the agency $2,500. Trelora will negotiate with that other agent to get their commission down to $2,500, for a total of $5,000 in realtor fees. Yes, some buyer’s agents walk away when they learn that they’ll be getting $2,500 instead of 3% commission. But others don’t. Nearly 70% of Trelora customers have only paid $2,500 to the buyer’s agent. Most people don’t realize when you’re buying or selling a home, everything – even commission — is negotiable, says Joshua Hunt, who founded Trelora. Hunt said it differs by agent, but typically buyer’s agents who accept the lower commission don’t want to risk losing their buyer (and future referrals from that person) or risk their buyer losing the house. They figure that some money is better than nothing, he added. Here’s an example of the savings you could see with Trelora. Your house sells for $500,000. Under the traditional 6% commission model, you’d be forking over $30,000 in total realtor fees. But with Trelora, you’re paying $2,500 or $5,000 — either way, you’re saving more than $20,000. For now, Trelora has offices in Colorado, but Hunt says he hopes to expand the company nationwide in the next five to seven years. How Do These Realtors Make Money? Before founding Trelora, Hunt worked as a top-producing agent for 20 years under the traditional commission model. He says he realized that there was room for innovation about four years ago. “Technology has advanced in the world and yet it has not yet been infused into real estate,” he said. Trelora agents close 300 sales per year. In comparison, a traditional real estate agent closes between six and eight deals per year, Hunt said. The company’s agents are able to close that many sales because they specialize in just one aspect of the real estate transaction. Instead of expecting agents to be experts in everything from marketing to contract law, Trelora splits up those responsibilities. It has field agents who show homes and work with buyers and sellers in the field, as well as office-based employees who specialize in marketing and contracts. The same is true for Redefy, which was also founded in Denver but has since expanded to more than 25 other cities, including Portland, Las Vegas, Phoenix, Austin and Orlando. “It’s a very efficient model in that, rather than spreading one person throughout all these things, we’ve put in place experts for each stage,” said Mike Perry, a spokesman for Redefy. Flat-fee realty could be coming to a city near you soon — Redefy hopes to be in 53 major and mid-major markets in the near future, Perry said. Redefy’s founder Jordan Connett was surprised when he realized that, although it’s much easier for a seller’s agent to list and sell a home today than it was in the past, they still make the same commission rate — despite doing less work. He also realized a percentage commission structure wasn’t fair to consumers. It may take the same amount of work to sell a $500,000 home as it does to sell a $200,000 home, but the realtor gets a much bigger payout with one than the other. In other words, consumers were paying more money for the same amount of work. Redefy’s founders conducted tons of research when deciding what flat fee would save customers as much money as possible while still allowing Redefy agents to make a living. They landed on $2,500 and it’s proved to be the “magic number,” Perry said. The two companies have faced some resistance from traditional realtors, who are understandably upset that clients can now pay thousands of dollars less by taking their business elsewhere. Both Perry and Hunt say they think part of the skepticism is also because the concept is so new. Eventually, they say, it will just be the way homes are bought and sold. “We are building a path that has never really been built,” Hunt said. Your Turn: Would you ever use a flat-fee realtor?